The extrodinary and helpful Tony Barr of East Riding Miniatures has come through to help me with expanding my range of figures for the Iwo project. 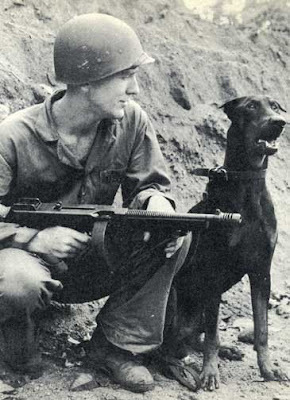 One of the heroes of Iwo was the working dog (aka War Dog). These animals were trained to deliver messages, sentry duty, mine detection and of course scouting/patrolling. They were very useful in finding people hiding in bush or caves. They were very useful in the battle of Iwo Jima in helping defend against sneak attack, night infiltration and ambush. I’ve worked up rules for hidden units in the Iwo game but they needed a possible counter and putting these working animals into the game seemed like a perfect fit. But it is hard to find WWII era war dogs in 20mm (or other scales). Tony has them for Vietnam but he has a wide collection of WWII marines so he is going to substitute the Viet Nam era marines for appropriate ones in period. We looked at a bunch of photos and saw what the handler were dressed as and the need for leads and such. I think we should end up with some really good looking stands. I also think the authenticity of the game experience will be greatly enhanced. You can find out more about East Riding Miniatures here. Some minis worth looking at are from Darkson Design. They are admittedly 28mm but they have dog units in all three factions and the US unit is exactly what you are talking about, with the addition of Doggles.